Original Editor - The Open Physio project. A strain to the muscle or muscle tendon is the equivalent of a sprain to ligaments. A muscle strain occurs when muscle fibers cannot cope with the demands placed on them by exercise overload and leads to tearing of the fibers. It is a contraction-induced injury in which muscle fibers tear due to extensive mechanical stress. This mostly occurs as result of a powerful eccentric contraction or overstretching of the muscle. Therefore, it is typical for non contact sports with dynamic character such as sprinting, jumping… ..
Grade I (mild) strains affect only a limited number of fibers in the muscle. There is no decrease in strength and there is full active and passive range of motion. Pain and tenderness are often delayed to the next day. 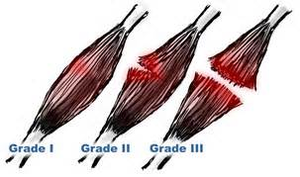 Grade II (moderate) strains have nearly half of muscle fibers torn. Acute and significant pain is accompanied by swelling and a minor decrease in muscle strength. Grade III (severe) strains represent complete rupture of the muscle. This means either the tendon is separated from the muscle belly or the muscle belly is actually torn in 2 parts. Severe swelling and pain and a complete loss of function are characteristic for this type of strain. Two-joint muscles. Specifically, the motion at one joint increases the passive tension of the muscle and leads to an overstretching injury. Muscles contracting eccentrically. Eccentric contractions, frequent during the deceleration phase of activity, may change the muscle tension and induce myofibre overload injury10. Muscles with a higher percentage of type II fibres. These are fast-twitch muscles which develop high speed contractions. In this way, the muscle is more predisposed to injury. Most of the muscle activity in running and sprinting is eccentric, explaining why such strains most often occur in sprinters or ‘speed athletes’. The hamstrings, gastrocnemius, quadriceps, hip flexors, hip adductors, erector spinae, deltoid and rotator cuff are most commonly injured. Strains are not restricted to athletes and can happen while doing everyday tasks, Athletes are more at risk for developing a strain. It is common for an injury to occur when there is a sudden increase in duration, intensity, or frequency of an activity. Muscle strain treatment depends upon an accurate diagnosis from your health professional. The severity of your muscle strain, and what function or loads your injured muscle will need to cope with, will impact the length of your healing and rehabilitation process. The first-line treatment for a muscular strain in the acute phase include five steps commonly known as P.R.I.C.E. Protection: Apply soft padding to minimize impact with objects. Rest: Rest is necessary to accelerate healing and reduce the potential for re-injury. Ice: Apply ice to induce vasoconstriction, which will reduce blood flow to the site of injury. Never ice for more than 20 minutes at a time. Compression: Wrap the strained area with a soft-wrapped bandage to reduce further diapedesis and promote lymphatic drainage. Elevation: Keep the strained area as close to the level of the heart as is possible in order to promote venous blood return to the systemic circulation. The first treatment is usually an adjunctive therapy of NSAIDs and Cold compression therapy. Cold compression therapy acts to reduce swelling and pain by reducing leukocyte extravasation into the injured area. NSAIDs such as Ibuprofen/paracetamol work to reduce the immediate inflammation. A new treatment for acute strains is the use of platelet rich plasma (PRP) injections which have been shown to accelerate recovery from non surgical muscular injuries. In the second phase, mobilisation must begin as soon as possible but gradually and within the limits of pain,Mobilisation has shown to improve injured skeletal muscle regeneration. Cardiovascular conditioning programme should be performed with low impact. Since core stability programmes have been shown to improve results in terms of lower re-injury rates and enhanced return to play, they must be introduced along with the specific rehabilitation programme of the injured muscle. After 2 or 3 weeks of injury, tension should be applied in the line of normal stresses for proper remodelling anatomically and functionally. Proprioceptive and endurance training are used in the advanced stages of rehabilitation. After the athlete has regained full, pain-free active ROM and over 90% strength bilaterally, full participation is allowed. Maintenance programmes should be continued to avoid any dysfunctional adaptation or compensation..
↑ Garrett WE Jr. Muscle strain injuries. Am J Sports Med 1996; 24:S2-8. ↑ Brumitt, Jason; Cuddeford, Tyler "CURRENT CONCEPTS OF MUSCLE AND TENDON ADAPTATION TO STRENGTH AND CONDITIONING". International Journal of Sports Physical Therapy. (2015).748–759. ↑ American Academy of Orthopedic Surgeons. Available from: orthoinfo.aaos.org. (accessed 26 February 2019). ↑ T. A. Järvinen, et al., "Muscle injuries: optimising recovery" , Best Pract Res Clin Rheumatol., 21 (2) April 2007, pp. 317-31. ↑ Halpern, B ; Chaudhury S; Scott A. "The role of platelet-rich plasma in inducing musculoskeletal tissue healing". HSS journal;2012;37–145. ↑ Page P. Pathophysiology of acute exercise-induced muscular injury: clinical implications. 1995; 29-34.